Recently I was invited to review the new Smyth’s Toy Store catalogue with the children and then take them shopping to review the shop itself. Couldn’t really turn that one down, could I? So we were sent a catalogue and some gift cards, and the children began compiling their wish list. It turned out that using a catalogue before going to the shop made the shopping experience *way* more pleasurable for all concerned (and how I’ve got this far into parenting without finding that out is a mystery to me quite frankly). The children spent quite a bit of time (two days!!) putting together their top 10 toys, which featured things like Hatchimals, Iron Man gloves, Minecraft diamond pickaxes or swords or general weapons of any type, Minecraft and Roblox figures and so on. 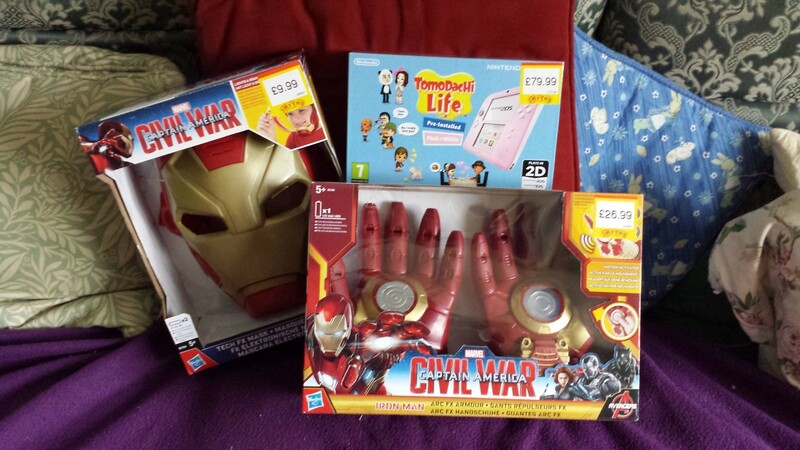 We discussed prices and what could be afforded with the gift cards we had, and Smallest decided what she really needed was a Hatchimal, while Tigerboy was very into the idea of Iron Man accessories. And then I pointed out to Smallest that we’re very near to her birthday, and that the voucher would go a long way towards the Nintendo 2DS she has wanted for a very long time, and that I would put the rest of the money in as her birthday present. Slightly to my surprise, she didn’t seem at all excited by this idea. She didn’t seem excited on the way to the shop, not even when we went in. Unlike Tigerboy who was practically levitating. And this was when the prep with the catalogue paid off. He was interested in the various things he saw. But all he wanted to actually get to and buy were the Iron Man gloves, and when I said that he could afford the mask as well – he squeaked. He actually squeaked. So we carted those off and went to look for the 2DS section. Smallest still didn’t seem happy, even when she chose pink from the available colours (pink and white or red and white. A 2DS with pre installed digital copy of Tomodachi Life. They didn’t have any of the other bundles in stock – so no option on the game but that didn’t seem to be a problem.) Once we had all the items in the bag, we headed off back to the car. Our bundle of goodies looked like this when we got them home. 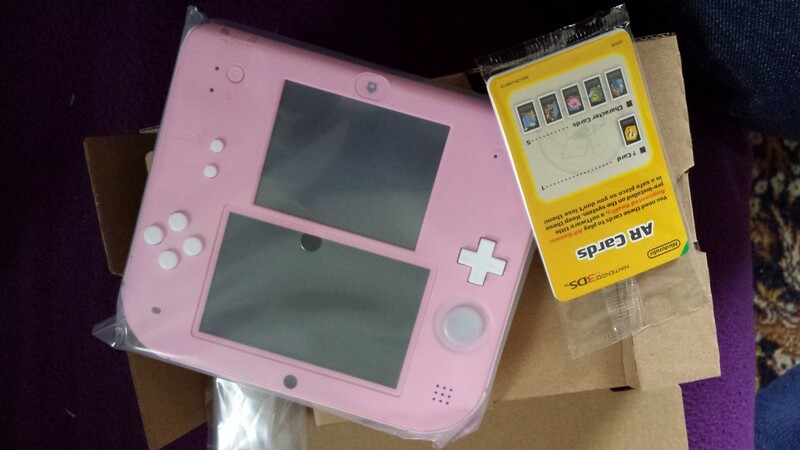 And the Nintendo 2DS is quite unremarkable in looks. 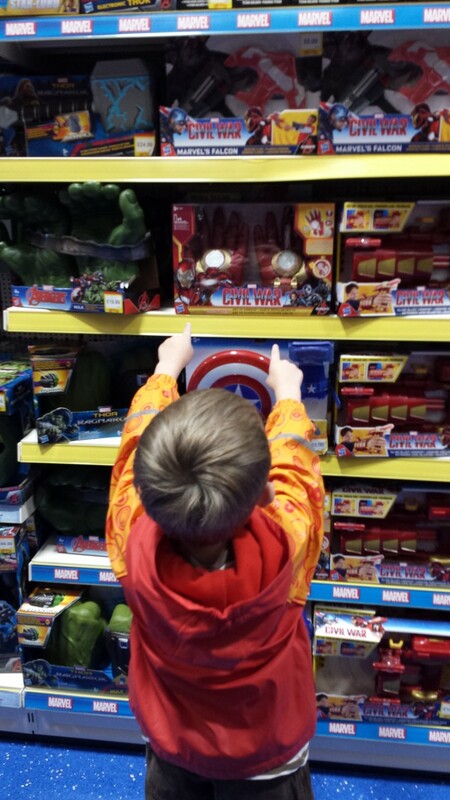 But I have an extremely happy nearly 8 year old, a 5 year old who can be Iron Man complete with light and sound effects and I’ve learnt that a catalogue and a wish list makes visits to toy stores an awful lot more manageable. I highly recommend it. How lovely! We live visiting Smyths, it’s a fair drive for us but they have such great deals on price!